Climate change has become a serious global issue and is affecting our lives and the place where we live. ENO pays much attention to solving this issue. As our school has participated in ENO for several years Climate Change Campaign and the March of Frogs have become our school tradition. As a rule, the whole school , its teachers and students take part in it. 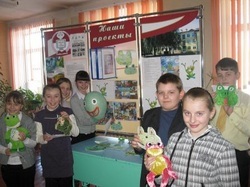 During this campaign the students learnt more about the impacts of climate change on our weather, flora and fauna and the development of agriculture in Belarus. They made Frank the Frog from papier-mâché, cardboard, plastic bottles. They drew masks and created posters. 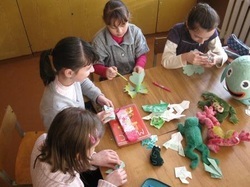 It was an exciting process of creating frogs which the kids liked very much. ENO Climate Change Campaign week started on February 11 in our elementary school where the most active ENO students (6th graders) visited the 1st and 2nd grades and told them about climate change and our actions to solve the issue. Frank the Frog collected 297 pledges from 123 students and 8 teachers there. 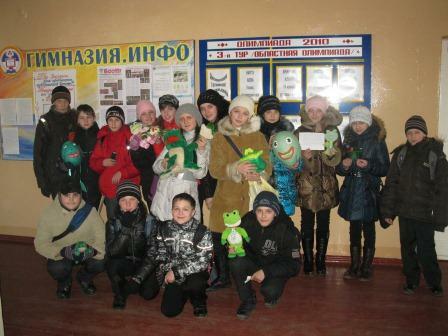 The students and teachers of our gymnasium were glad to meet Frank the Frog again and feed him with their pledges. He met our headmistress and her executives, teachers and students and visited our school library, canteen and buffet. Many parents joined this campaign. We sent our pledges to Frank the Frog’s bank. 534 children and 62 adults became active participants of the campaign. Thus Frank the Frog collected 1147 pledges only in our school. The March of Frogs started at 12 o’clock on February 16. The opening ceremony was broadcast on our town’s TV (http://www.youtube.com/watch?v=q--bG3BPJZw) and was covered in the newspaper “Slonimskaya gazeta” . 30 students and 4 teachers with the frogs marched along the main Slonim’s street and square trying to draw people’s attention to the issue of climate change and asking them to join in to stop climate change in order to reduce its impact on our lives, on our environment and on future generations. The passers-by thanked the children for this campaign and made their pledges. Many of them had already started doing the things they were suggested. The team of volunteers got 498 pledges. They also visited our town’s Department of education where 10 people gave 47 pledges. Frank the Frog wasn’t hungry as he had gathered a great “harvest” of pledges – 1692.